Proteins constitute almost one-fourth of your muscle fibers. The rest is composed of water and glycogen, (the longer-chain version of glucose). Since 1940s dietary protein began to be consumed resulting in positive muscle building results in resistance and strength training athletes. Protein intake is a part of the nutrient requirements for the regular athlete and is an important component of exercise training because it can also aid in performance and recovery. On an average, a woman needs 46g of protein in a day and a man requires 56g. If you too like most vegetarians worry about the requisite protein intake, the article is for you. It's a myth that protein comes only from flesh foods. Dairy foods, beans, greens and certain nuts are good sources of protein. To get the basics right, proteins are made of amino acids. Chemically, nitrogen, hydrogen, carbon and oxygen combine to form a molecule of amino acid. Together, these molecules form protein, which are a necessary part of every living cell in the body. In the human body, protein functions to build and maintain your body, fight off disease, and keep energy levels high so that you can stay alert all day long. From milk to cheese, dairy foods provide ample protein and are good sources of calcium. A cup of milk and yoghurt (240ml) provides similar protein content, but yoghurt is a better source of protein because it is a wholesome package and offers easily absorbable calcium along with the advantage of good bacteria for your gut health. Cottage cheese or paneer, on the other hand, is a powerhouse source of protein, so much so that it is acknowledged as a meat alternative in India in a low-calorie format. It is a delight for weight watchers. A cup of grated cheese is a good source of protein too, in a calorie dense format. Hence, it is good for kids and fitness enthusiasts, who have high protein demands. Rest of us need to exercise caution with cheese. An excellent source of protein, fiber, and heart-healthy fats almonds are loaded with essential vitamins, minerals and antioxidants that will aid your body in building muscle and let you remain slim. A handful of almonds has more protein than an egg and contains energy-boosting manganese and copper, a potent antioxidant for anti-ageing effect. A surprising source of high-quality protein, quinoa was grown by Incas in South America, but it is gaining popularity worldwide. A quarter-cup of cooked quinoa provides 5 grams of protein. It is especially rich in the amino acid lysine, which is important for tissue growth and repair. Quinoa works well in soups and salads and can easily serve as a substitute for rice in most recipes. Versatile and nutritious, soybeans are an exceptional source of protein for vegetarians, because they contain the nine essential amino acids that your body can't process and relies on food to obtain those. Like all plant foods, soy is cholesterol free, a good source of fiber. Apart from these add-ons, soy protein has heart-healthy omega-3s. An economical, high quality, fiber rich and low-fat source of protein, beans are packed with antioxidants. Switch beans and lentils to get ample antioxidant advantage. You can get a 10-18g of protein with a cup of cooked beans. Diets that include beans may reduce your risk of heart disease and certain cancers. Another bean bonus: A recent study found that people who eat beans weighed on average 7 pounds less and had smaller waists than those who didn't eat beans. To reduce some unpleasant side effects, rinse beans in water to reduce their gas-producing effect. However, a point to note is that beans are not a wholesome source of proteins hence they need to be paired with whole grains to make complete protein available to the body. Now you know the logic behind rajma chawal and roti daal combo. Now, that you are informed, quit worrying about protein content in your diet, because if you are a healthy eater, chances are high that you are getting ample protein on a vegetarian diet. 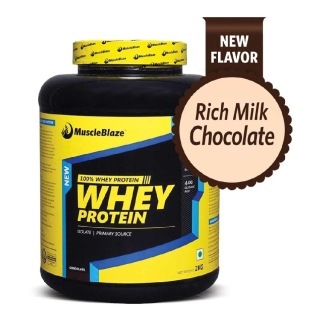 Just lift and lift heavy and drink your favourite MuscleBlaze Whey Protein as it is made from vegetarian sources.